Does Solar Thermal work in the winter? Yes it does, it provides up to 30% of your hot water need in the winter, it may only preheat the cylinder but this reduces the boiler load to heat it to 60 degrees. Can I install Solar Thermal for space heating? Short Answer is yes . . .But it will not provide very much space heating, if you have a suitable system we can reduce your heating by up to 10% but typically about 5% and systems cost about £15,000 for a domestic house so is not cost effective. Is Solar Thermal suitable for swimming pools? Swimming pools are one of the easiest application for solar thermal and can be a great way of gaining very high returns from the RHI. Should I get Solar Thermal installed at my school? Solar Thermal is not suitable for buildings with little or no use during the summer it would be far better to install either a PV system or Biomass boiler. Do Solar Thermal systems grow legionella? Poorly designed systems can but a correctly designed system can reduce the risk to any other type of hot water system. 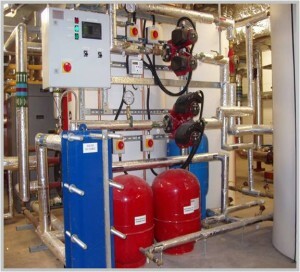 With plate heat exchanger system the risk is reduced even further. Aren’t Solar Thermal systems are only suitable for domestic houses? No. Larger solar thermal systems are specially designed and are not just up scaled domestic systems. With larger systems we design in double headed pumps so that a pump failure will not shut down the system, controls with BMS outputs and pipework and valves rated far higher than domestic systems. Can I generate electricity with Solar Thermal Panels? You can not generate electricity with Solar thermal panels but there are panels caled PVT (Photovoltaic and Thermal) panels which are very early to the UK and we are still testing this type of panels before adding it to our product range.